Let your players be your marketing people! Image 1. A winner’s alert. 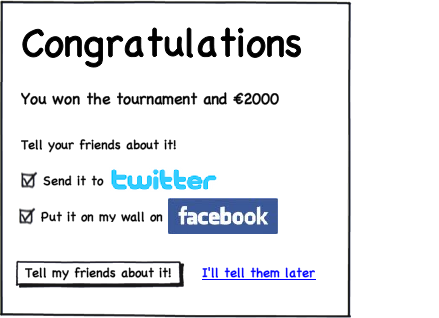 Let players post results on their social networks! Why not let your players be your marketing people? One way of doing this is to make it possible for them to post results on Twitter, Facebook, MySpace and other social networks. By doing so friends there will read about it and your gaming portal! In the image above you see one example of how this could be done. You only need to associate the player account with their accounts on social networks. I hope we will see more social feature integrated into gaming portal and software in the near future. It is one area uncovered by most gaming portals today.